Protein supplements dominate the fitness nutrition world. Muscle and strength are built on a foundation of protein. Not only does protein build the muscles with which you punch and block, it also assists in recovery of those muscles so that you can get back in the ring tomorrow. Athletes use protein supplements primarily to repair and rebuild muscle that is broken down during exercise. Protein also serves to enhance carbohydrate storage in the form of glycogen, which is used for energy. All of this is crucial to optimize training and performance. There are countless brands of protein supplements to meet this need, and they vary in more than just cost and flavor. Different types of protein may serve to satisfy various needs. All protein is not created equal. 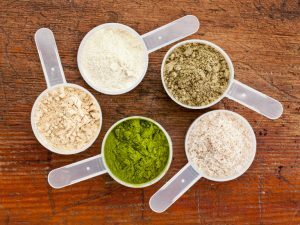 BoxingInsider.com has broken down the basics of 10 of the most popular protein types that you may come across. 1. Egg Albumin is not commonly used in the powder form, but rather bought in a carton or container and cooked. People may have thought Rocky Balboa was crazy for drinking his eggs, but he knew what he was doing. Eggs are fat-free and high in protein, which is great for weight-loss, plans. They are also versatile because unlike most other supplements they can be consumed in liquid or solid form. 2. Casein Protein is the only form recognized for its benefits during sleeping hours. This is due to its ability to keep the body anabolic throughout the night. It takes anywhere from 5-7 hours to fully break down. When used during the day it helps to curb hunger. 4. Whey Isolates are quick absorbing and pair well with low carbohydrate or low sugar diets. Isolates are different from concentrates in that they yield a higher percentage of pure protein and can be filtered to become virtually carb, fat, cholesterol and lactose-free. 5. Whey Protein Hydrolysate is enzymatically predigested for maximum absorption speed. This process provides a rapid spike in blood amino acids is beneficial for protein synthesis as well as the breakdown of amino acids for energy. 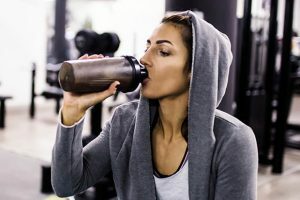 Though this boost may be especially helpful during a long workout or post-workout/ pre-day job, it is not ideal for those looking for storage of the protein for continual use. It is also on the pricey side. 6. Milk Protein Isolate (MPI) is a combination of 80 percent casein and 20 percent whey protein. 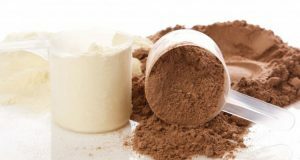 Because casein is slow to digest and whey is quick to digest, the combination of the two provides short-term and long-term muscle recovery. Most forms of MPI are not lactose-free. 7. Pea Protein is also highly digestible and as an added benefit, research shows that it may help prevent hypertension and kidney disease. It is also gluten-free and is a good choice to also curb appetite. Studies have shown that pea protein supplements lead to better satiety than milk or whey protein. 8. Soy Protein is made from soybean meal that has been dehulled or defatted. Aside from being a good vegetarian option, it is loaded with glutamine, which assists in recovery. Soy has been found to boost thyroid hormone output, speed up metabolism and support cholesterol health. 10. Brown Rice Protein powder is also gluten-free and has nearly as high a protein concentration as soy. It is also a good option for those who may have gastrointestinal issues, though it is not always easy to find.